Our dentist, Dr. Peter Wong has the experience and education it takes to provide for your family’s dental needs! Couple his background in dentistry with the genuine concern he feels for each patient, and you have your dentist in Langley. In fact, all of the Amazing Smile staff is dedicated to patient comfort and prompt attention. In our office, keeping your smile healthy and beautiful is our top concern. We invite you to navigate our website and learn more about the field of dentistry and our services, staff, and practice. As you browse our site, you will find the opportunity to learn more about our philosophy, office location, appointment scheduling procedures, and insurance policies. We hope you won’t hesitate to contact us if you have any questions. With one quick call, you can also schedule an appointment at our Langley office. Here at Amazing Smile Dental, it is our belief that a well-informed patient is better equipped to make good decisions concerning their health and well-being. That’s why we have taken the time to fill this site with valuable information about dental problems, treatments, and diagnoses. We hope that you will take advantage of this information and begin to understand any health concerns you may face. Whether you need to schedule a regular check-up or an emergency dental appointment, our dentists in Langley are here to help! We offer everything from cosmetic dentistry to as well as restorative and orthodontic care. 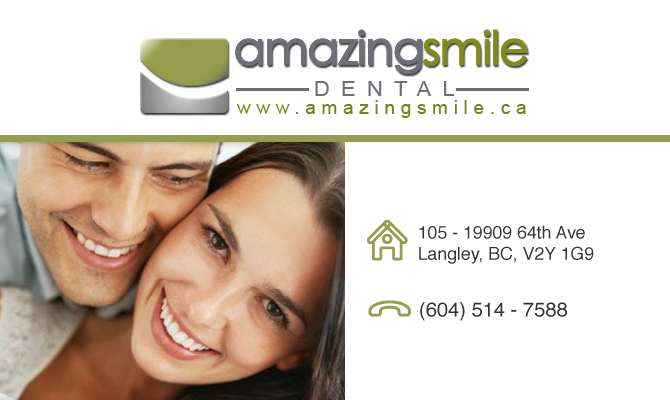 Please contact us no matter the situation and we’ll see that your dental needs are met by our expert Langley dentist. Fill out the form on the “Contact Us” page or give us a call today and schedule your appointment. We look forward to meeting with you!